By George L. Lyon, Esq. 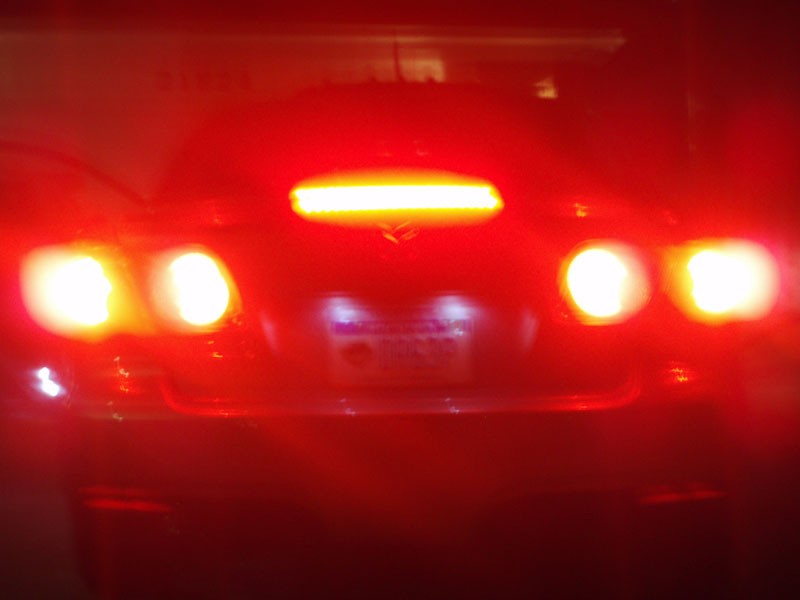 While most people could honestly claim they have never had an issue with the first five of Givens’ six R’s, one study estimates that more than half of all drivers have experienced road rage. Road rage should be taken seriously by gun owners particularly. Even if a road rage incident does not involve fisticuffs, a collision, or gunfire, the handling of a gun to ward off another driver could turn a temper tantrum into a crime. A road rage incident begins when one driver takes offense at the actions of another driver and decides to “teach him a lesson.” Actions can range from yelling at the other driver to more dangerous actions when the offended driver decides to use his vehicle as a tool to exact retribution. These dangerous actions can include tailgating, continuously shining bright lights from behind during nighttime, cutting in front of the other vehicle and slamming on the brakes (brake checking), attempting to stop the other vehicle and instigating a verbal argument or physical altercation, or in extreme cases trying to run the alleged offending vehicle off the road or pointing a gun at the other driver or shooting. For anyone, a road rage incident threatens physical safety and would likely result in legal problems. For persons who carry a firearm for personal protection, getting involved in a road rage incident carries an even greater risk of legal difficulties. Let’s look at three recent incidents, all of which vividly demonstrate the need to handle road rage incidents carefully and to contact police immediately. Incident one. Motorist A is proceeding on the interstate in the left lane. His lane is about to end so he floors it, whizzing past Motorist B in the next lane and cutting into that lane. Motorist B takes offense and pulls up beside Motorist B yelling and veers into his lane causing Motorist A to veer onto the shoulder of the road. Motorist A accelerates and pulls away from Motorist B. In response, Motorist B catches up with Motorist A, who believes Motorist B is about to try to push him off the road again. Motorist A displays a pistol, causing Motorist B to back off temporarily. Motorist B then returns while holding an object out the window. Motorist A believes it might be a gun, and he aims his pistol at Motorist B. The object is actually a camera. Motorist B backs off, incident over, or is it? Motorist A proceeds to his destination only to be pulled over by the state police who arrest him for brandishing. Incident two. This incident is very similar to Incident One. Motorist A is driving on the highway and makes a lane change. Next thing he knows Motorist B is tailgating him extremely closely. Motorist A taps his brakes to cause Motorist B to back off. The brake checking apparently provokes Motorist B to the point that he comes up beside Motorist A and like in the previous example veers into Motorist A’s lane while yelling and screaming. Motorist A pulls into the next lane to turn right into a shopping center. Motorist B follows him into it until Motorist A shows him his firearm. Motorist B hesitates and then drives on. Motorist A leaves his car to grab a coffee. When he returns to his vehicle, he finds the police waiting for him. They ask whether he is carrying a firearm. He says yes. They arrest him for brandishing. Incident three. Motorist A is driving on an interstate highway in the fast lane with a passenger. He soon finds himself behind the slower driving Motorist B. Motorist A flicks his bright lights on and off to induce Motorist B to move over. Motorist B responds with repeated brake checks. Motorist A quickly bypasses Motorist B and races ahead. Motorist B then gives chase well over the speed limit. As the two vehicles are momentarily side-by-side, Motorist B points a gun at Motorist A. Motorist A is legally armed but does not respond in kind. Motorist A makes a high-speed exit off the highway followed by Motorist B. Seeing a red light ahead at the end of the exit, Motorist A decides running the light to escape is better than risking a gun fight, but he then crashes into a vehicle traveling through the intersection in the cross traffic. Motorist B drives on. Lessons Learned. What did all three innocent drivers have in common here? None of them called the police while the incident was occurring. In the first two incidents the aggressor, rather than the perceived victim, called the police, and the police arrested the victim. In the third incident, police responded to the accident but did not charge the driver who ran the red light. Note, that in the third incident, there was a passenger in the vehicle who could confirm the driver’s story. induce in the mind of another the likelihood of being shot. Noted firearms instructor and use of force expert Massad Ayoob has explained that the first person to call the police is typically assumed to be the victim, which leaves the other person as the apparent perpetrator. It is obviously necessary to call police if you must shoot in self-defense. However, merely drawing, showing, or even pointing to a concealed gun to stop an attack is a use of force that requires calling the police as well, and if such action is not justified, it is itself the crime of brandishing. In Virginia, for example, brandishing is defined as holding or pointing to a gun in a public place in a manner that would reasonably induce in the mind of another the likelihood of being shot. Brandishing is punishable by up to a year in jail and a $2,500 fine (Va. Code §18.2-282). Self-defense is a defense to a charge of brandishing. However, a valid self-defense claim requires you to be an innocent party. Innocence plainly means that you did not start the fight. However, in states like Virginia, it also means that you did not provoke the confrontation. Here in Virginia, if you are the least amount at fault in bringing about the confrontation you are required to break from the confrontation, announce your intent not to fight and retreat prior to using deadly force. That fault can arise from gestures, insulting words, or, in the course of road rage incident, retaliation, such as brake checking, tailgating, etc. Speaking of gestures, firearms instructor John Murphy cautions, “Don’t engage in digital communications.” That is not a reference to driving while texting. Instead, Murphy is referring to the bird, that is to say the display of the most triggering finger other than, well, your actual trigger finger. Murphy illustrates his teaching points with realistic scenarios, and his courses often feature road rage (seewww.fpftraining.com). He strongly advises students to disengage and subdue their ego before something regrettable happens. “If you think the guy that just cut you off is going to make you late for work, imagine how late you're going to be after a ten year stretch in prison,” remarks Murphy. When possible, avoidance is the preferred response to danger, but we all must be realistic about the probability of road rage within ourselves and from others. If you find yourself in a road rage situation, it is crucial to contact law enforcement as soon as possible. George Lyon practices law licenses in Virginia and the District of Columbia as part of Arsenal Attorneys™, a nationwide law practice. He has decades of experience including complex litigation and criminal defense. Mr. Lyon frequently teaches self-defense law and tactics, including the requirements for carry permits in the District of Columbia. He was one of the original plaintiffs in the Supreme Court’s landmark Second Amendment decision in Heller, and he was a plaintiff in the recent Palmer case compelling DC to issue carry permits. On October 20-21, Mr. Lyon will be offering his next seminar addressing DC carry permits, firearms regulations, self-defense law, and tactics. 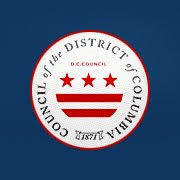 The program will fulfill requirements for a DC carry permit, which are available to non-residents. Arsenal Attorneys regularly advise and represent clients dealing with the difficulties of traveling with firearms, including differing state laws, complex federal laws, and the multiplicity of rules for parks, schools, and other places which could sometimes be gun-free zones. As the summer travel season approaches, we want to share a word of caution from the Transportation Security Administration. TSA discovered 90 firearms in carry-on bags around the nation last week. Of the 90 firearms discovered, 73 were loaded and 35 had a round chambered. Firearm possession laws vary by state and locality. TSA may impose civil penalties of up to $13,066 per violation per person for prohibited items violations and violations of other TSA regulations. Repeat violations will result in higher penalties. Travelers should familiarize themselves with state and local firearm laws for each point of travel prior to departure. You can go here for more details on how to properly travel with your firearms in checked baggage. All of the firearms pictured were discovered over the last week. See complete lists below. TSA officers set a record on May 3rd, for the most firearms discovered in carry-on bags in one day. 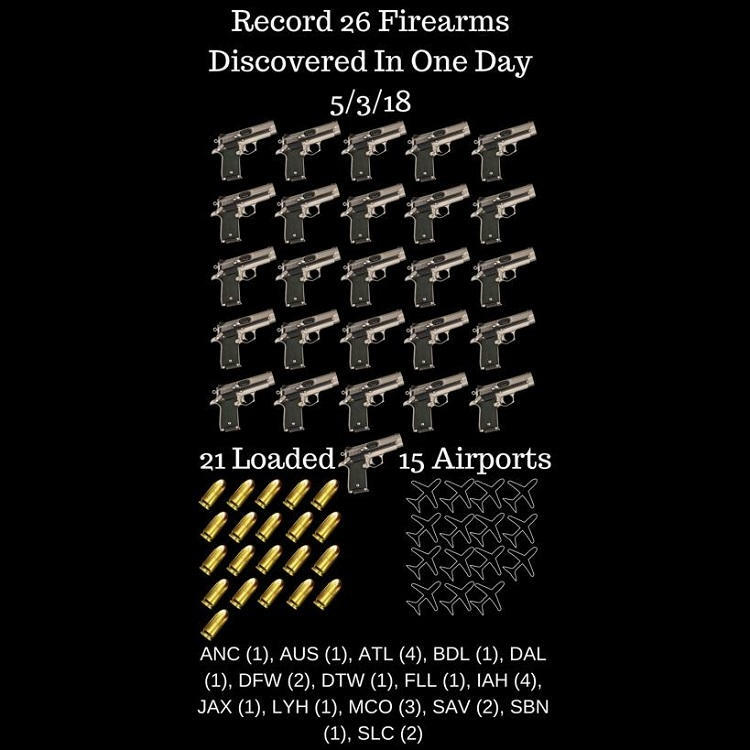 26 firearms were discovered at 15 airports. 21 of the firearms were loaded. If packed properly, ammunition can be transported in checked-baggage. . . You can go here for more details on how to properly travel with ammunition in checked baggage. Since the ‘41F’ changes to the rules for registering NFA firearms by trusts made by the Obama administration, any person qualifying as a ‘responsible person’ in a trust must complete ATF Form 5320.23, which includes fingerprints and photographs for each new NFA application. A ‘responsible person’ would include any person authorized to possess your trust’s NFA firearms. This raises two key points. First, Form 23 only applies to responsible persons who are in your trust while an NFA application is in process. Thus, if you remove a ‘responsible person’ from your trust before submitting an NFA application, that person would not be subject to Form 23—even if you re-appoint that same person to your trust after receiving a new NFA tax stamp. Second, neither the beneficiaries, who inherit your trust’s firearms, nor the successor trustee, who manages the trust after you, need to be a ‘responsible persons.’ Thus, you could appoint a successor trustee or a beneficiary for estate planning purposes without exposing those people to the fingerprint and photo requirements for Form 23, if your trust is designed accordingly. There could be hundreds of thousands of NFA trusts designed before 41F and Form 23. They did not anticipate the requirements for ‘responsible persons.’ Many of these were do-it-yourself trusts, and they lack updated guidance or legal support for the new regulations. Many of these trusts inadvertently gave ‘responsible person’ status to various co-trustees, co-settlors, co-grantors, beneficiaries, successor trustees, etc. ATF is now rejecting applications by these trusts if they do not include Form 23s for each of these responsible persons. Assuming it’s undesirable to collect fingerprints and photos for responsible persons in a trust other than the principle trustee, you may avoid this red tape by removing these other people from your trust before submitting an NFA application; however, we recommend you make changes to your trust with the help of a qualified attorney. For example, if you remove the only beneficiary in a trust, you could invalidate the trust. Before and after 41F, Arsenal Attorneys’ Arsenal Gun Trust avoided these problems, and we keep our clients apprised of important developments in this area of law. If you’re concerned with a trust you obtained elsewhere, you can become an Arsenal Attorneys client. We can then completely revise your existing trust using our Arsenal Gun Trust design. The revision, or ‘restatement’, would enable you to change the people in your trust and make other updates, such as an address change. Your restatement would include forms customized for you to add/remove ‘subordinate trustees.’ Other than you, the subordinate trustee would be the only other person(s) who would qualify as a responsible person for new NFA applications. Thus, you could use the forms to remove subordinate trustees if you wish to exclude those people from new NFA applications. After receiving a tax stamp, you could then appoint (or re-appoint) subordinate trustees to your trust so they may possess your trust’s NFA firearms—without ever having completed Form 23 and without providing fingerprints and photos. The concept of a ‘subordinate’ trustee is one of many innovations by Arsenal Attorneys. In comparison, typical gun trusts give people authority to possess your trust’s NFA firearms by appointing them as co-trustees; however, that status could make them your co-equal, and, therefore, threaten your control over your own gun trust. From the beginning we’ve always made our clients the sole person to control the trust, and subordinate trustees are given only the limited authority they need for safe and legal possession of NFA firearms. Arsenal Attorneys™ is perhaps America’s largest firearms law practice with thousands of clients nationwide. We have taught firearms law for the American Bar Association, the Federal Bar Association, the Financial Planners’ Association, and the National Rifle Association. Our attorneys include certified firearms instructors, FFLs, one of the original plaintiffs in the landmark Heller case, and a plaintiff in the successful Palmer case for DC carry permits. Recently we won 2nd Amendment suits overturning unconstitutional laws in DC and Baltimore. 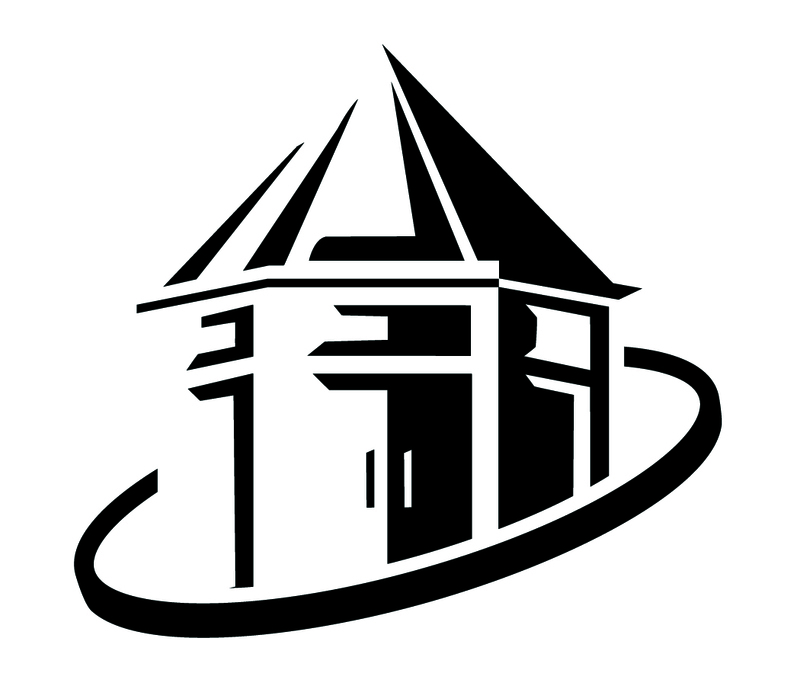 We operate as a modern law practice, using online technology to serve clients conveniently and efficiently by phone, email, and shipments of their documents to their doorstep. Our mission is to help clients acquire, handle, and inherit firearms. Our vision is to deliver legal services so focused on our area of specialty that we can offer the highest quality in a cost-effective manner. To obtain a new Arsenal Gun Trust or to request a restatement of a trust you obtained elsewhere, complete our online questionnaire at this link. On Thursday, March 22, 2018, the District of Columbia City Council's Judiciary Committee will hold a public hearing on several bills affecting the gun rights of District citizens and visitors to the District. The hearing will take place in Room 500 of the John A. Wilson Building, 1350 Pennsylvania Avenue, N.W., at 10:30 am. Arsenal Attorneys intends to be present to testify and suggests that area gun owners consider appearing and testifying as well. Each of the proposed bills is described below. Bill 22-0193, the "Temporary Protection Order Firearm Relinquishment Amendment Act of 2017," would amend the District of Columbia Code to require an individual subject to a temporary protection order to relinquish the individual's firearms. Bill 22-0400, the "Extreme Risk Civil Protection Order Amendment Act of 2017," would authorize a court to issue a temporary ex parte extreme risk civil protection order if there is a finding that there is a reasonable belief that the subject of the petition poses an immediate and present danger of causing personal injury to self or others by possession or control of a firearm, and would establish an extreme risk civil protection order for the duration of one year to remove firearms when a court finds by a preponderance of evidence that the subject of the petition poses a significant threat of harm to self or others. This bill is particularly problematic because of the use of such low standards as "reasonable belief" and "preponderance of the evidence," as opposed to traditional higher legal standards such as "clear and convincing" or the criminal standard of "beyond a reasonable doubt." Bill B22-0588, the "Possession of Firearm and Ammunition Penalties Amendment Act of 2017," is also problematic. It would prohibit a person from knowingly possessing or receiving any firearm with a tampered serial number; prohibit a person from possessing a stolen firearm or stolen ammunition; prohibit the possession of ammunition by individuals previously convicted of felonies; and increase the penalty for possession of a so-called high-capacity magazine to a felony. By contrast possession of ammunition by a felon would only be a misdemeanor. PR22-0552, the "Sense of the Council in Opposition to Concealed Carry Reciprocity Resolution of 2017," would declare the Sense of the Council in opposition to congressional action which allow individuals who are licensed to carry a concealed firearm in any state to carry their firearms in the District of Columbia. In other words, the Council intend to go on record opposing concealed carry reciprocity. The public may testify and/or submit written testimony on these bills. Anyone wishing to testify should contact the Committee via email at judiciary@dccouncil.us or at (202) 727-8078, and provide his or her name, telephone number, organizational affiliation, and title (if any), by close of business Monday, March 19, 2018. Representatives of organizations will be allowed a maximum of five minutes for oral testimony; individuals will be allowed a maximum of three minutes. Witnesses are encouraged to bring twenty double-sided copies of their written testimony and, if possible, also submit a copy of their testimony electronically in advance to judiciary@dccouncil.us. For witnesses who are unable to testify at the hearing, written statements will be made part of the official record. Copies of written statements should be submitted to the Committee at judiciary@dccouncil.us on or before April 6, 2018.